note below Robert's vital statistics, the engravings of the 508th and 82nd logos as well his jump wings with one combat jump star. 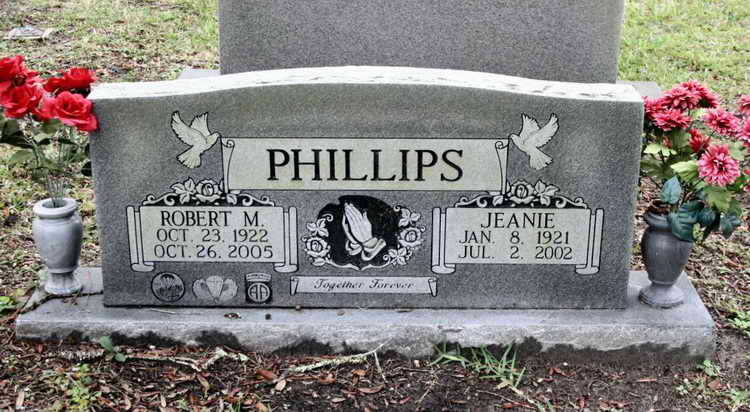 Robert Moses Phillips, 83, of Middleburg, FL passed away October 26, 2005. He was born October 23, 1922 in Waycross, GA to Mose and Minnie Lee Phillips and has been a resident of Middleburg since 1986. Funeral services will be held 2:00 PM Saturday, October 29, 2005 at Town & Country Funeral Home, 7242 Normandy Blvd. Burial in Riverside Memorial Park will follow. The family will receive friends Friday, October 28, 2005 from 6-8 PM at the funeral home. During World War II, Robert served our country valiantly as a member of the 82nd Airborne Division 508th Parachute Infantry Regiment. The 508th PIR won the Presidential Unit Citation for heroic performance in the D-Day Normandy invasion June 6, 1944. The unit was chosen as General Dwight D. Eisenhower's honor guard at the end of the World War II and received honors from France, Belgium and Holland. Robert earned the Bronze Star and Purple Heart for his heroic service to our country. He married his sweetheart Jeanie Parrish on August 30, 1946 and they celebrated 55 years of marriage together before her homegoing on July 2, 2002. They are now "Together Forever".